All kitchens who use a commercial fryer will know that oil is an ever-increasing expense and to deliver consistently crisp, clean and tasty food, the oil needs to be either regularly replaced or regularly cleaned. Traditionally, disposing or cleaning oil is a messy and laborious process, having to be done once the oil has cooled down, service has to shut down etc. It can be a slow process where time costs the operator money. Now, with the latest generation of compact, high performing oil filtration systems from VITO, the hot oil can be filtered in between operations with no need to shut down or wait for the oil to cool. By filtering the oil, the life span is improved significantly, as is the taste of the food cooked. Removing microparticles of carbon produced during cooking (as small as 5µm) has a massively positive effect not only on the quality of the food, but also on the health of your customers and staff. Fried foods are healthier with good oil management by removing the tiny particles of burnt food or “carbon” in cooking oil. Many of these particles are recognised carcinogens and they are one of the reasons why fried food is considered unhealthy. Importantly, VITO systems will save the kitchen up to 50% on oil costs every single week when compared to units without a filtration system. But also, if used with a built-in filtration system VITO will save up to an additional 30%. It reduces the quantity of oil you need to buy and store. Also, the cost of safe disposal of used oil is decreased. We expect all of these costs to continue to rise and new costs to come into play too. Sustainability is also a big cornerstone for VITO: A single VITO system reduces the operator’s carbon footprint by over 5,000 kilograms over a 5 year period which is also good news for the environment. On top of that VITO uses fully biodegradable cellulose filters - something to tell your eco-conscious customers. 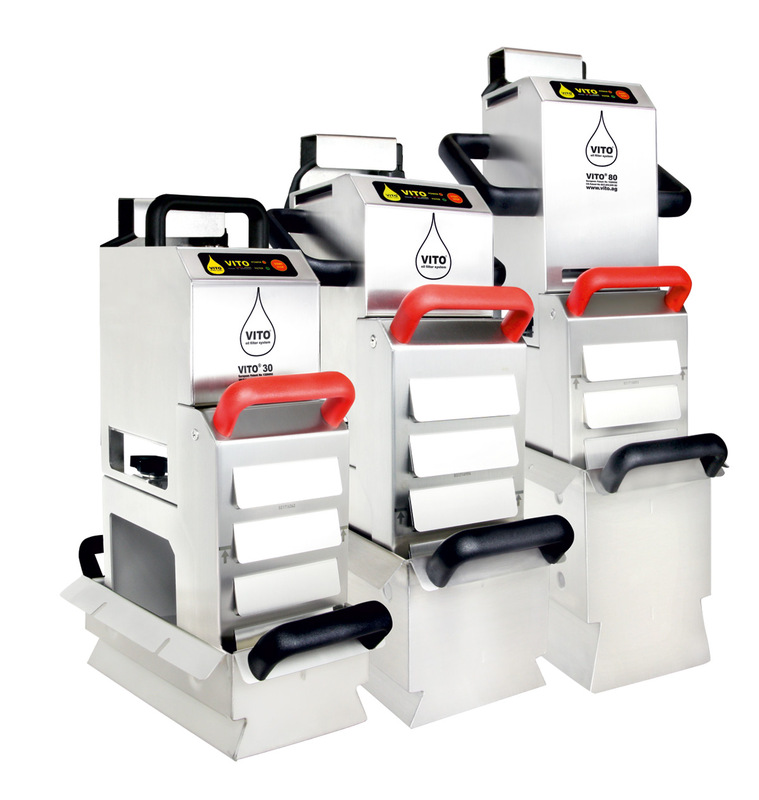 VITO systems now come in a choice of models suitable for fryers from 12 litres upwards. Big customers like Marriott Hotels, Radisson, Hilton and Burger King outlets in mainland Europe eagerly adopted the VITO 50 & 80 system. Savvy restaurateurs and bar owners are rushing to use the VITO 30 system – a cost-effective machine for smaller businesses. Recent customers include TGI Fridays, Hard Rock Café, and the new Catch 22 in Dublin. Given the explosion in the dining out scene in Ireland with both bars and restaurants seeing a huge increase in custom, we expect to see VITO oil filtration systems in more and more venues around the country working hard for the benefit of the operator and their customers. VITO is distributed exclusively in Ireland by Industrial Hygiene and Catering Equipment. For more information, check out their website http://www.ihce.ie or contact Patrick Nagle on Ph: 01 460 4044.